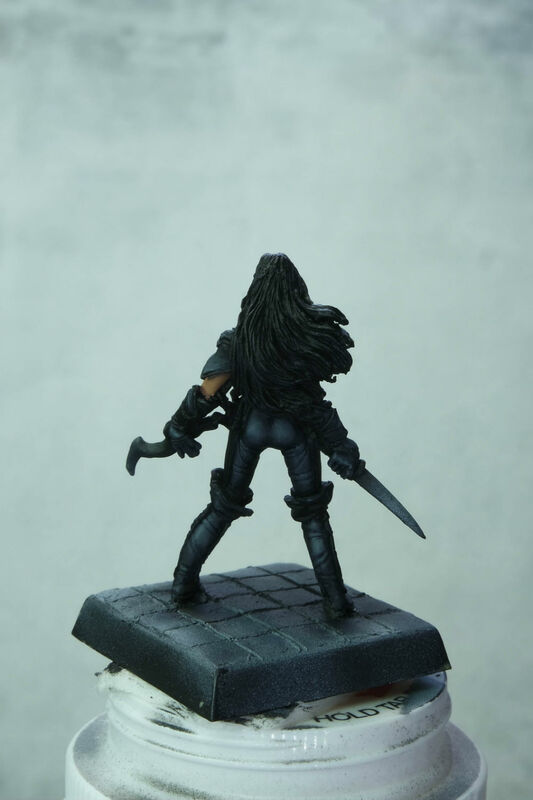 Here are some early WIP shots of a current commission – Reaper Cleric of Calistria. This is an awesome sculpt, although the eyes are cast a little uneven and I am still trying to work that out. Just a quick update…if you’ve been thinking about getting a commission on the schedule, my spring is filling up quickly. The next available start date I have is March 16th, and there are a couple projects that could move that date out as soon as deposits are made. In order to secure a place in my queue, details and a deposit should be worked out sooner rather than later! Games Workshop/Citadel – This is probably the most widely available paint line out there, which is a big pro, especially if you don’t have a lot of game stores in your area. The pots are horrible, and your paint *WILL* dry out faster than it ought to. The paint costs more per ounce than most other paints, also. I feel like the pigment density isn’t as good as other lines, although it is serviceable and you can probably accomplish anything you need to with it. 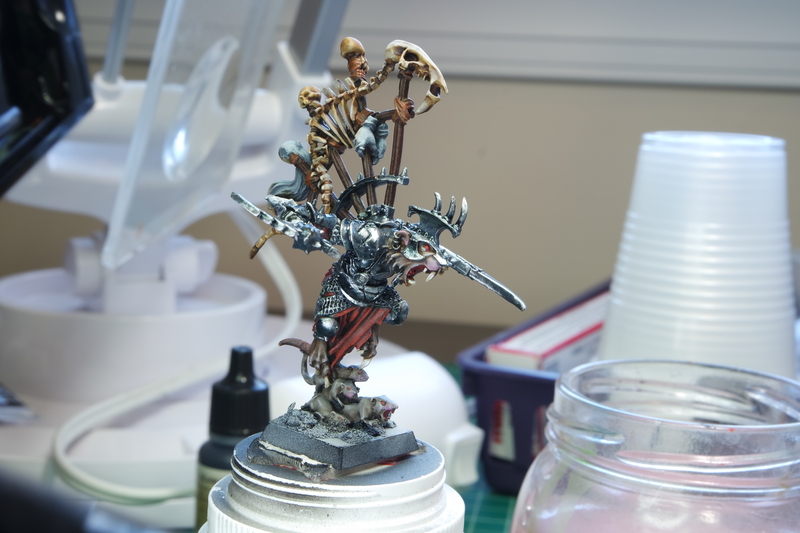 The paint line is quite large, and it is set up in such a way as to promote a painting process that is 1. prime 2. basecoat 3. wash 4. drybrush 5. highlight edges. I feel like this teaches bad habits and can actually limit a person’s painting growth unless they take it upon themselves to research new ways to do things and even new things to try to do. 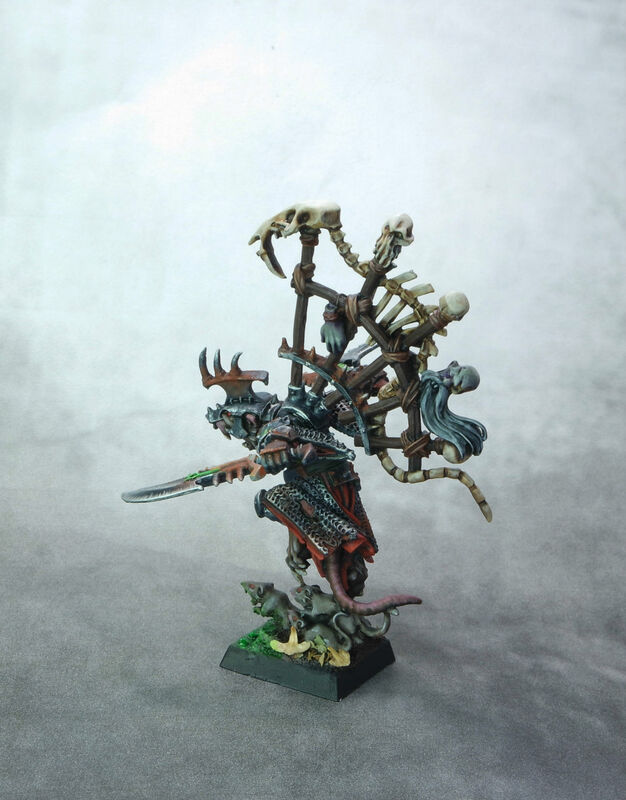 I’ve been asked by prospective commission clients how many washes and drybrush highlights a particular painting standard contains – typically these people have been greatly influenced by GW and ‘Eavy Metal painting. For most commission painters, rarely does this describe the actual painting process. Reaper Master Series – At least in my area, this is the second most widely available paint line. It is also the one I ended up purchasing a great deal of when I first began painting. These paints really are great, and that’s not just my Love of All Things Reaper talking. The dropper bottles keep your paint usable for much, much longer than the Citadel pots. Rarely, a dropper bottle will unexpectedly shoot out a bunch of paint after being shaken, but that’s something that seems to happen occasionally with every paint that is in a dropper bottle. My biggest complaint with Reaper paints was that after several years the paints started having tiny dry bits inside that would cause me problems if I tried to airbrush with them. That probably has little to do with the paint line, and more to do with the age of my paints. The paints are among the least expensive per ounce. The paint line is set up in triads of a shadow color, mid-tone, and a highlight color. Although the shadows are typically darker and cooler, and the highlights are typically warmer and lighter, I personally found that there just isn’t enough contrast within a triad to be able to get away with only using the colors within it. It may be possible that that is a result of how I paint and not something everyone experiences. I don’t know. I also feel like although the triads are designed for convenience and to take the guess work out of it for people that aren’t as familiar with color theory, they also are something of a disincentive for people to learn color theory in the first place and learn how to pick colors on their own. The trick is to stop looking at it as triads, and just look at it as a selection of different colors. One last minor complaint is that this paint will rub off if handled a lot before being sealed, especially on metal miniatures. 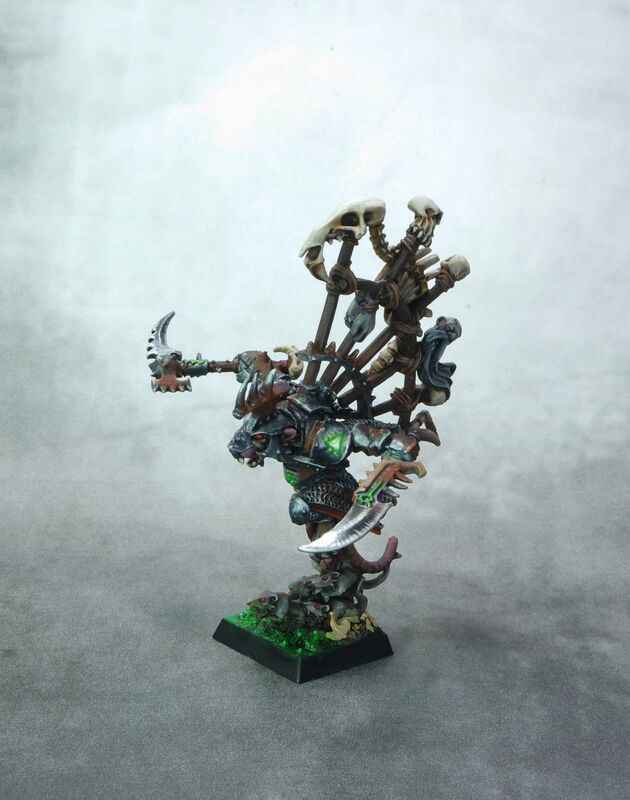 That is something that can be fixed by mounting the miniature on something to hold during painting and sealing the mini before use. I’m sure by this point you can tell that I think all-in-one solutions for the painting process and color selection aren’t particularly helpful in the big picture. 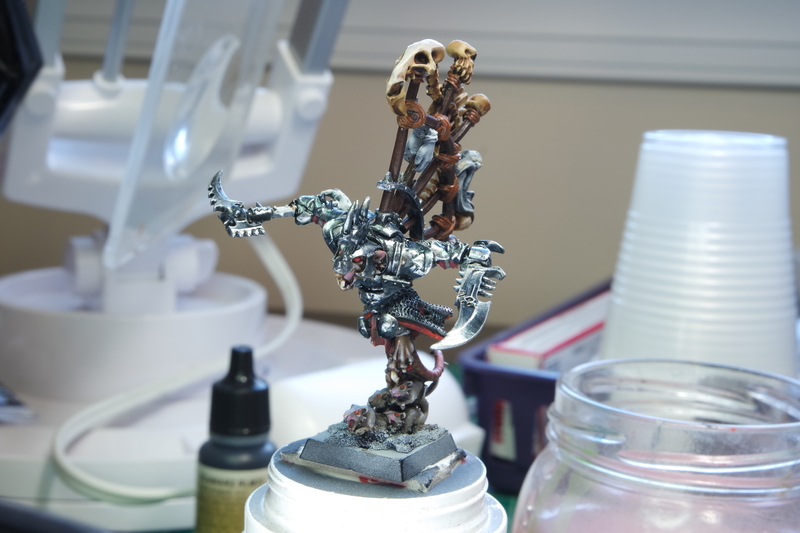 I still regret wasting time trying to learn to paint by reading GW’s How-to-Paint book, and also trying to make triads work for me and wondering why my results just didn’t have the contrast they needed. That being said, I only switched away from Reaper paints when I was running out of basically all of them and was going to have to buy a ton of paint either way. I would still happily use them if I was in a situation where I didn’t have access to my own paints. I also still have a small selection of Reaper paints that I just can’t live without. 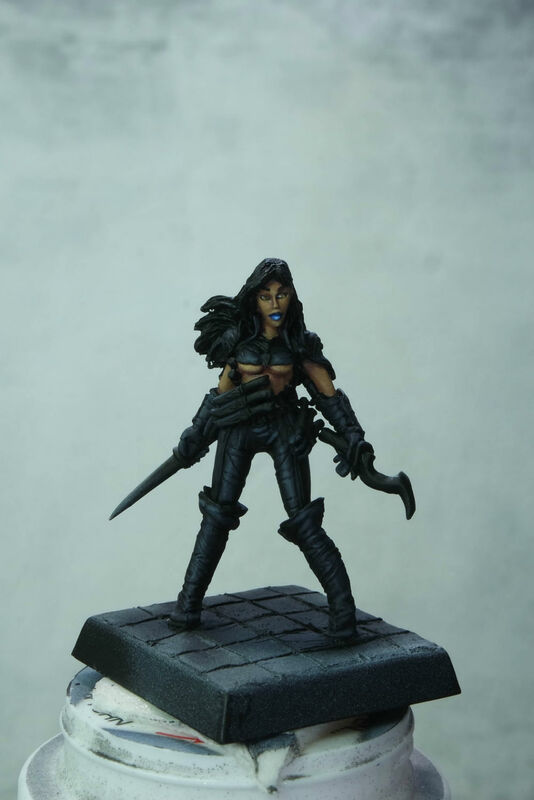 Vallejo Model Color – This is one of my most preferred paints, and it is what I ended up replacing my empty Reaper paints with. The paint is quite thick and requires thinning no matter what you are doing with it. Price-wise it is pretty middle-of-the-road. The line is absolutely huge and includes traditional artist colors, accurate military colors, and many, many others. Some game stores have at least part of this line in stock regularly. I feel like this paint separates a little less than others, but it still happens. I haven’t had any problems with this paint rubbing off, and after a day or two it’s pretty tough. The active time on this paint seems to be a little on the short side, and as with any paint, the weather conditions have an effect on this. Really, this is a well-rounded, quality paint. 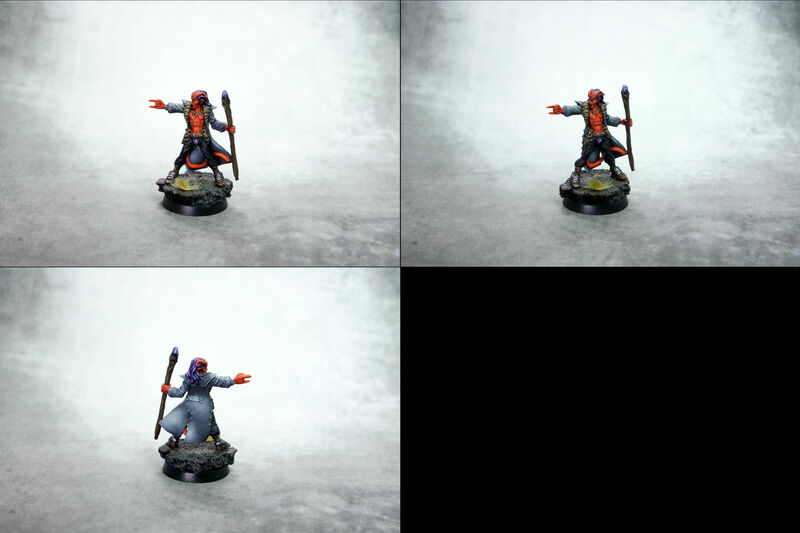 Vallejo Game Color – This is actually one of my least favorite paints, avoided almost as much as GW. They are the same price as Vallejo Model Color, but their consistency is thinner like Reaper. They also rub off if handled before sealing. The line isn’t as big as Vallejo Model Color, and although it has all the staples, it seems to gravitate towards brighter, Fantasy-type colors. The thing that really put me off of this paint is that when thinned, especially if thinned a lot, it behaves…funny. I had difficulty applying thin, smooth layers of color. Also, when applied while thinned, it sometimes beaded up on the surface on my models. It didn’t really matter what surface I was applying it to, it just beaded up sometimes, and other paints did not on the same surfaces. I had these experiences with all of my game color paints, so it was not just a bad bottle. I don’t have so much extra time that I can spend it fighting my paint, so I had to get rid of these. Vallejo Model Air – Another great paint line from Vallejo. This paint is similar in cost to Model Color, smaller selection of colors, but thin enough to airbrush straight from the dropper bottle. It mostly contains earth tones and military colors, but there are some brighter colors as well. In my experience, this paint is one of the hardest to find, although some game stores do stock it sometimes. It just seems like even if they have a rack for it, it’s almost always at least half out of stock. In my experience, this paint is the one most likely to unexpectedly shoot extra paint out when you open it after shaking. One other con is that some of the yellow and orange tones have significant problems with coverage. These paints have my absolute favorite metallics, however. Vallejo Liquid Gold (alcohol based) – These metallic paints have a fantastic finish, but I find them difficult to work with. They are pretty expensive, and almost impossible to find in a store, but readily available online. My biggest gripe with these is that they don’t like to neatly stay put on the model. Not having the surface tension of water will do that. That being said, for some people I’m sure these have their place. P3 – This is a line of paints that I don’t have quite as much experience with, but I do have a few things to say about it. They come in pots similar to Citadel paints. The pots aren’t nearly as likely to dry your paint out, but they have resulted in my spilling half a new bottle of paint all over my painting table in a way that would never happen with a dropper bottle. The working time of these paints is pretty long. They are also quite thick, so they need thinning pretty much always. The line has a very limited range of colors centered around the studio color schemes for the various Warmachine and Hordes armies. That being said, as with any line of paint, if you don’t have the color you need you can certainly make it. I feel like making good use of this line of paint requires some knowledge of color theory and how colors mix. I haven’t had any trouble with these paints rubbing off before being sealed. I personally find these paints a little inconvenient. Badger Minitaire – This is a relatively new paint line (or perhaps a reformulation/re-branding of an older line of paints by Badger) that I tried to use for a couple weeks. They are probably the least expensive paint out there. They are supposed to be able to be sprayed with an airbrush straight from the bottle, but I found them overall a little thick for that. This line is pretty comprehensive, although I still found myself wishing for a few more bright colors. The most interesting thing about this paint line is the Ghost Tints, which I found the most use for with a brush instead of an airbrush. These reactivate very easily, even if sealed sometimes. These paints separate horribly. I had brand new paints that required manually stirring and then 15+ minutes of shaking to be able to use at all. They also re-separated within seconds on my palette. When brushed, even when thinned and brushed on in super thin layers, I found these paints to be so shiny that I had to keep spraying the model with a satin varnish just to be able to see enough to keep going. In addition to being shiny, when brushed on, especially when thinned, this paint forms bubbles on the model. These two problems made it unusable for me. I have to have a paint that I can both brush and spray, and this one did not work for me when brushed. That being said, there are some painters out there that are doing fine with these paints. Vallejo Game Air – This is a brand new paint line, and I love them. I haven’t seen these paints in any stores, but they can be found online. It’s still a little tough to find them for a reasonable price to ship to the US, but that will change with time. They are pretty much exclusively bright, fantasy-type colors, so I find the need to maintain another line of paint as well. They can be sprayed straight from the bottle, and their price is similar to Vallejo Model Color and Vallejo Model Air. I haven’t had any problems with extra paint shooting out in the two months I’ve been using them, but I assume it’s coming at some point. They act like Model Air, but like an improved version. I haven’t had any problems with coverage. Strangely, they smell amazing. Army Painter – I use Army Painter Inks, and I love them. They are inexpensive, can be found in a lot of stores, and are very versatile. They are not just an alternative to Citadel washes, but if you want to wash with them, you can. They do match some of the colors quite nicely if you’re replacing Citadel. If you want to glaze, go for it. I find they are great for shading and giving the impression of texture. They are also useful on metallic paints. Unlike some other inks, they do not reactivate. Army Painter also makes paints, but I have absolutely no experience with them, so I can’t speak on that. There are other paint lines out there that I have not yet tried, but I know other painters have success with. Off the top of my head I can think of Andrea, Scale 75, and Golden acrylics. 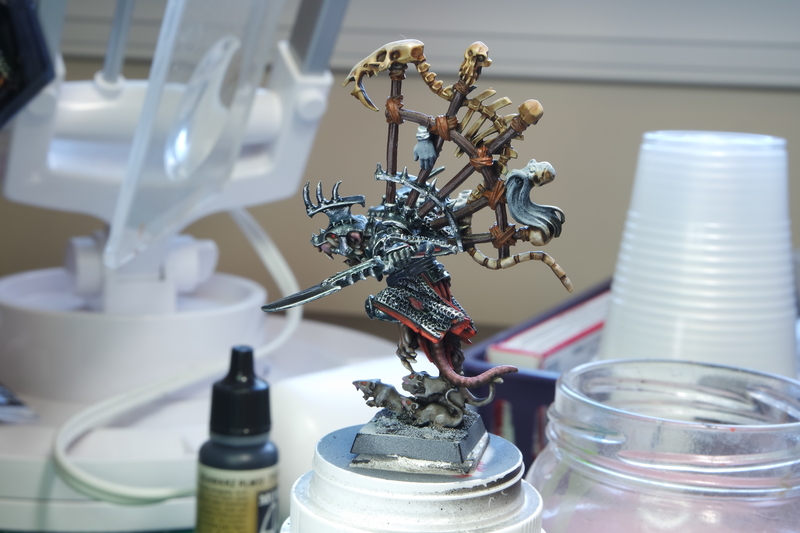 Here is a model from the first Reaper Bones Kickstarter that I decided to go ahead and paint in between other projects. 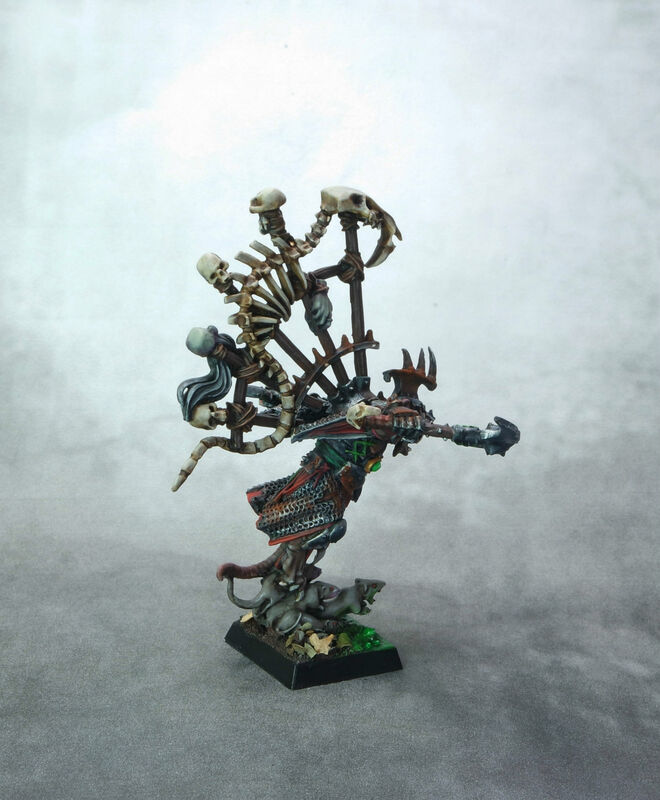 He had one of the better casts for a Bones model that I’ve come across so far. 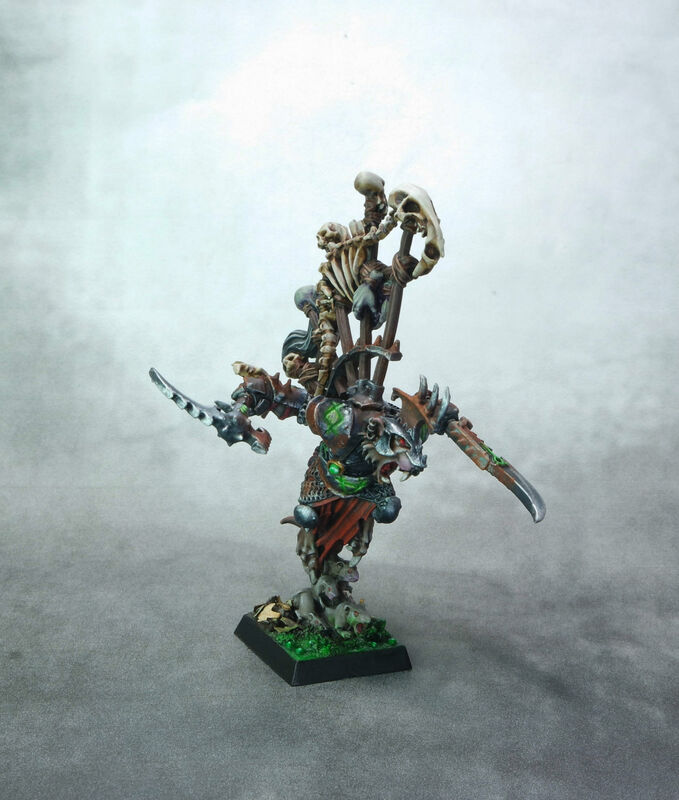 I am going to make an effort to get through more models from that kickstarter this year…especially since the Bones II Kickstarter will be shipping soon and I backed it as well, so I’m about to have an absolutely ridiculous number of Bones minis!